This month’s photography blog ring topic is simply “light”. The topic allows A LOT of room for interpretation and experimentation! Ensure you read all the way to the bottom, and follow the link to the next blog participant – Ruth O’Leary! Over the past year, I have been really feeling out my style in terms of what I do in the studio. I felt that up until recently, that I was all over the map, and that my photos were not really clearly identifying as mine. I am happy to say that although I NEVER intend to stop experimenting, growing and improving, I am finally happy with my style of studio photography! The hardest lighting set up for me to learn has been “low key” lighting. Which, in everyday language, basically means high contrast, more directed light. You will often see this style of photography with a black background. 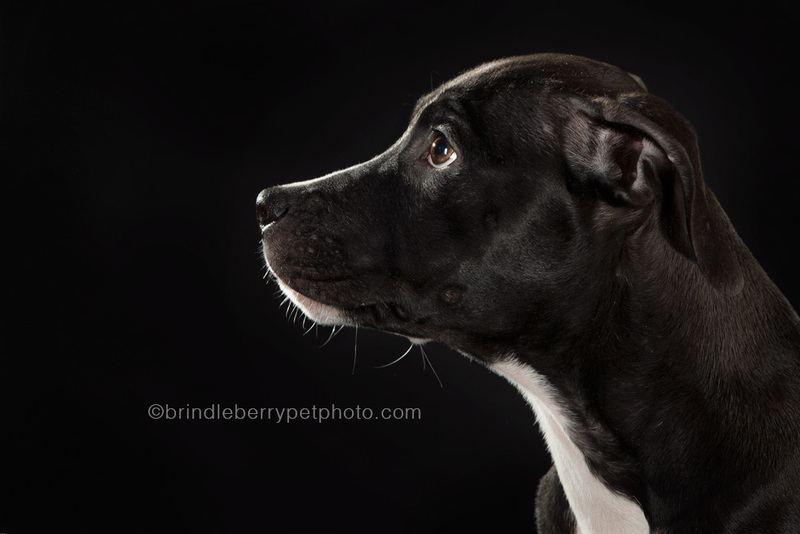 I did a project a few months ago here in Calgary called “Black is Berry Beautiful” in which I featured several black dogs on a black background. I had a lot of fun with the project, but the lighting, although very close, still wasn’t exactly what I was after. There is a lot of info online about how to light low key, and it’s all different. LOL. And, most of it doesn’t consider pets as subjects. Pets have things like floppy ears, that can block light and cast shadows in a way that people don’t. AND… they move. 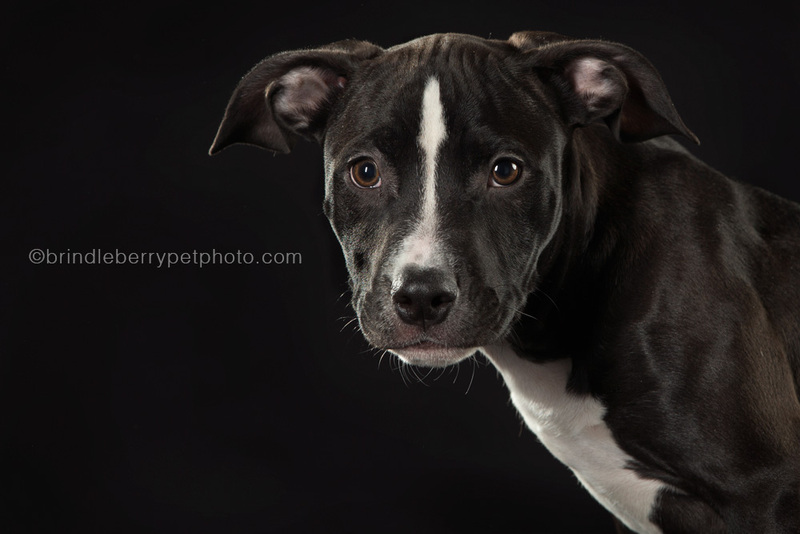 AND, I am finding that the light modifier most of them recommend, a beauty dish, makes a POP noise that scares a lot of the dogs I work with. So, I have ditched it for modifiers that are less frightening. You don’t see that happen when photographing people. LOL. There are also a lot of techniques I simply don’t care for, so finding something that makes me happy too has been a challenge! I am pleased that after another kick at the can tonight, I found a lighting set up that I am happy with, and I think I can call it my own (I know, it’s all been done, but as far as my brain knows, it’s all mine. LOL). 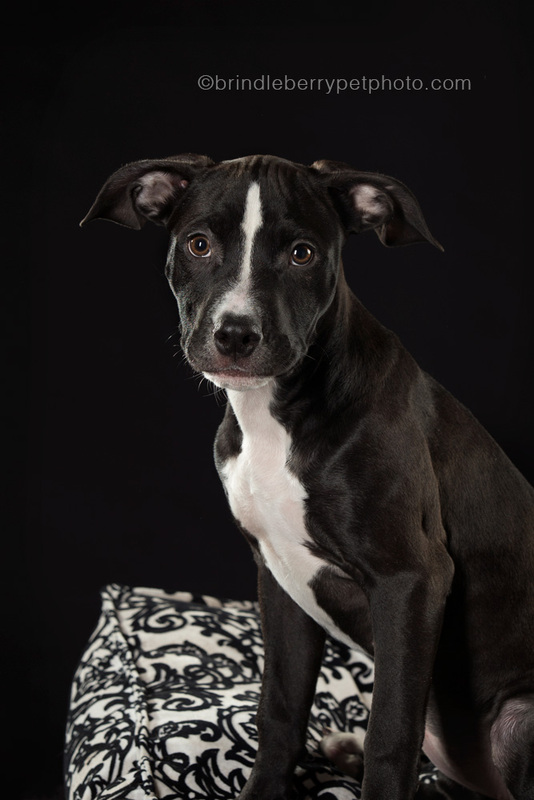 If you are interested in getting your pet’s portrait done in low key, a few things to consider… your pet does not have to be black. And, this lighting set up is less forgiving in terms of where the animal can sit. It is a very specific, small space that they need to “hang out” in so that the lights can hit them in all the right places! 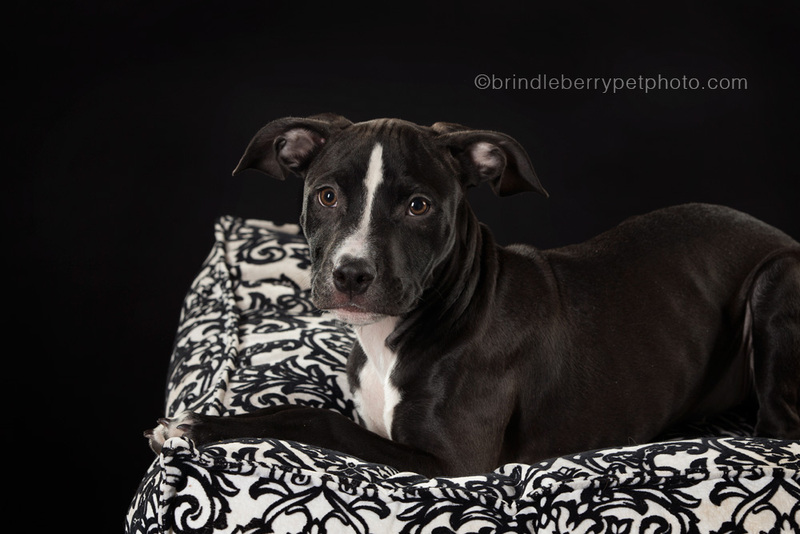 Bella is a very shy, little Pibble baby that came in to help me out with this one! Isn’t she beautiful!? The point of a blog ring is that you get to follow around and see what everyone else came up with! This month, I am excited to share the amazing work of Ruth O’Leary all the way from Ruthless Photos in Sydney, Australia! We’ll see you next month with a new challenge!